These Cables Keep You Playing! Planet Waves Classic Series Instrument Cables offer you the key details you need to make sure your tone stays intact. They feature Planet Waves' exclusive In=Out technology to give you a guitar cable with the purest signal transparency and the longest life possible. 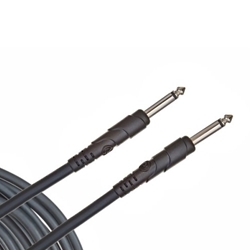 Nickel-plated plugs and oxygen-free copper ensure that Classic Series Instrument Cables remain highly conductive. Dense shielding and molded strain reliefs keep handling noise at a minimum and extend the life span of each cable. So, if you're looking for a great-sounding cable that will last forever, pick up a Planet Waves Classic Series Instrument Cable.